In case someone is interested, i put together a site, http://sites.google.com/site/fractals3d/home, for what I feel is a more geometrically correct multiplication, operating on geodesics. Can you show us a high resolution render of your z^2+c version ? Nice, can you post here the formulas? I'll try to do it in the coming days. I assume you refer to power 2 mandelbrot and not julia set? I'll post the code snippet as well. Thing is that the one in this image has a assymmetric top/bottom in power 8. BUT the power 2 looks identical to yours. I have lurked here for way too long so decided to join the party. After experimenting with the triplex algebra and alternate formulas for a while now, I have a few things to contribute. 1. 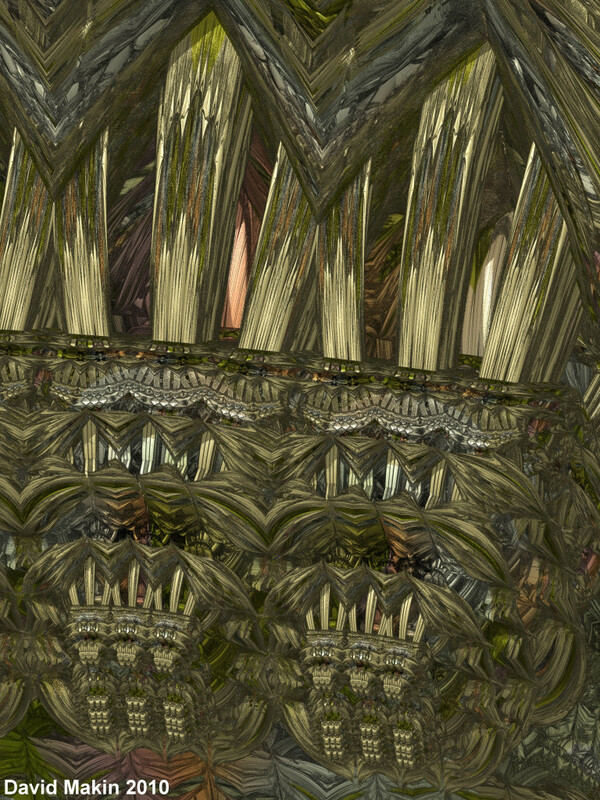 "IQ variation" This comes from Inigo's page here http://iquilezles.org/www/articles/mandelbulb/mandelbulb.htm. 3. Negative COS. Same as Daniel's original COS version with a negative z. 4. Negative Rucker. Again, same as the Rudy Rucker variety with a negative z. They all give unique results and new bulbs to explore. There probably are a whole bunch of other variations to explore and render. If anyone has other ideas for other variations please share. http://softology.com.au/gallery/gallerymandelbulb.htm I also have links to my flickr galleries with zoomed in sample images. The more complex formula varieties do lead to more disconnected and "dusty" fractals (which is logical as it is like comparing the 2D Mandelbrot to the more complex versions of the mandelbrot formula), but when zooming in they do give some unique new looks. Thank you for that summary, some interesting variations there. If you could add the power 2 renderings aswell it would be great. One thing I do miss is renders of top vs bottom of the non symmetric power 8 bulbs. I have found it out for myself now, but it took a while, would be nice to have here in your list bugman! The "Mandelbulb Power 8 Reversed Order Positive Z" looks very interesting in pow 8!!! Looks a bit like hobolt:s riemandelettuce, is it the same formula/coordinate system? And the other variations have different trig when calculating theta,phi and the x,y,z components of triplex z when doing cartesian to polar conversions, exponents and multiplication. From what I can see the riemanlettuce uses a different system entirely and creates a more discinnected surface. The variations all seem to work with formulas other than z=z^p+c, so finding new variations leads to a whole bunch of new fractals to explore when using multiple formulas. I would be interested in any other variations other people have tried using the above style changes. Also you can mix and combine these in multiple ways e.g. using 2 as in the Mandelbulb or using 3 or maybe even 4 !! When I get chance I'll post more details on the ones I've tried in this thread but I'm currently not getting enough time to work on improvements, let alone on adding documentation !! If you're OK reading UF code then you should follow the ones I've tried if you look at the formula (wip3D5), though there are precious few comments and some of those may not be correct (after cutting/pasting). I found that in the cases I've tried a simple adaption of the Mandelbulb analytical DE method works but in some cases required extra scaling. How do I use these variations with the usual triplex algebra? What part of the calculations do they replace? Which parts of the calculations do I need to change to implement your variations? Although I'm not sure if that's what I did without checking, I do know that the above has a problem in that it does not maintain a unit scale from the trig calculations so to avoid the problem I renormalised the trig part before multiplying by the new magnitude (r) and adding the constants - if the trig part was (0,0,0) then I used newx=r+cx, newy=cy and newz=cz. Just tried another idea for getting a "true 3D" Mandelbrot. The result is more similar to the "true 3D" attempts using the unit multiplication table variations than the Mandelbulb so I was going to discard the method completely but I decided to try applying the generic Mandelbox-style square folding and the result was extremely interesting....will post a result in this thread - about 20 minutes to go. This is just a variation of the "Christmas Tree Fractal" formula from Paul Nylander's website (that I accidentally recreated). Anyways, if you don't take the absolute value of the y pixel component, it is more "true" to the classic 2d Mandelbrot, in the sense that the 'distortion' (asymmetry) introduced by the - x component in the classic 2d Mandebrot for even n (z^2,4,6,8....) is magnified by the y component's interaction with the z component. I'd think that this was "the real deal", simply because it follows the same pattern of distortion as the 2d Mandelbrot, but it isn't as pleasing as something that replicates the look and feel of a 2d Mandelbrot for even z^n. r3=r1^-n; //take it to the negative power to avoid division by zero error! Trig version of above code, with abs of y pixel component (which introduces symmetry). start_z=new_z+abs(pixelj);	// !!!!!!!!!!!!!!!!!!!!!! !MAKE SURE YOU TAKE THE ABSOLUTE VALUE OF THE Y COMPONENT!!!!!!!!! !